Most of us know that the cannabis plant produces compounds that react with the human body. That’s because we have our own system that makes similar compounds, cannabinoids, that have a wide range of actions from appetite control to immune function. Cannabis contains a cannabinoid called THC that interacts with the brain, resulting in euphoria and relaxation, as well as increased hunger and anxiety. It was long thought that there was no other natural source of cannabinoids – and along with a long list of supposed medical uses the mythical power of cannabis, and the psychoactive properties of THC, has grown. But as it turned out, another plant contains something similar: a compound that has the structural hallmarks for it to act on the brain in a similar way to THC. The discovery of this lost twin, called cis-PET (perrottetinene), or PET, was tucked away in specialist chemistry journals in papers published in 1994 and 2002, with no subsequent research confirming its biological activity. But in a new study, published in Science Advances, a group of Swiss scientists have delved into the mechanism by which PET may be acting on the brain. The particular liverwort in question, Radula, is endemic to New Zealand and Tasmania and is used as a herbal medicine by the Maori people. Preparations using this plant are also sold as a THC-like legal high on the internet. But while similar to THC, does PET actually produce the same effects that THC does at a cellular and molecular level? Does it mimic the physiological effects? And is it different in ways that could give it therapeutic advantage or disadvantage? Some 24 years after its first discovery, the team of chemists and biochemists behind the new study have teased some of the answers out. Their research was no mean feat. It required a new synthesis method to produce enough PET to do meaningful experiments. Once this was achieved, the researchers looked at two mirror versions of the two compounds, cis (the version found in the liverwort) and trans (a version they artificially created in the lab). In chemistry, the cis and trans terms tell us which side of the carbon chain the functional groups are (the bit of the molecule that does the work). The researchers wanted to find out if these two versions of PET were able to interact with the two receptors found in humans that mediate the psychoactive effects of cannaboids – CB1, the receptor that produces the “high” effect from THC, and CB2 – in the same way as THC (how strongly they bound and how much is needed to produce an effect). The researchers found intriguing similarities between the two versions in PET and THC. For both PET and THC, the trans versions (the abundant THC version found in cannabis and the lab-synthesised version found in liverwort) bound to the CB1 receptor better than the cis versions. What’s interesting about this is that while the levels of cis-PET found in the liverwort plant are too low to produce the “high” effects produced by THC (hence why smoking PET won’t produce a high), it could explain why PET might still have a medicinal effect (similar to the effect produced by lower dose THC). 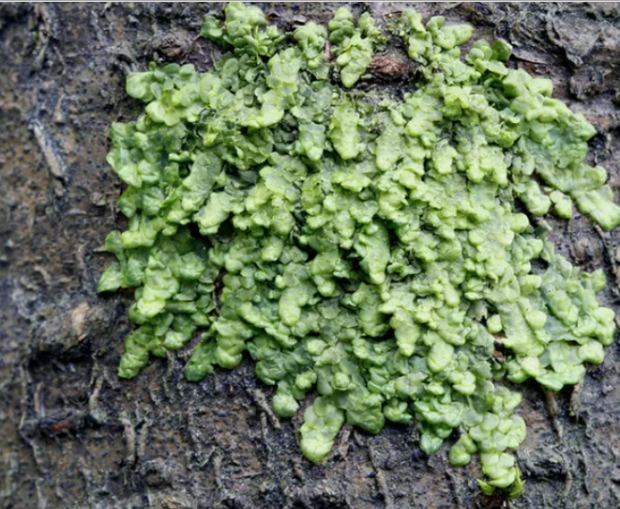 However, any methods to extract and concentrate the liverwort compound could lead to the same problems as THC. But what about CB2, the other cannabinoid receptor? This receptor plays a role in immune responses. Here the Swiss scientists found that the cis versions of both THC and PET bound this receptor better than the trans versions. The implications of this are yet to be explored, but it again hints at a potential medicinal benefit worth exploring further. The authors of the study then went on to test whether the binding of the CB1 receptors in the brains of mice had the same recognisable THC effects. Usually when THC binds with this receptor it produces four key effects: reduced body temperature, muscle rigidity, reduced movement and decreased sensitivity to pain. In this behavioural test, all four effects were also achieved in the mice using cis-PET, albeit in a much bigger amount. But there was one notable difference. Inflammation in the brain is mediated by molecules called prostaglandins that can be derived from metabolic pathways involving our own body cannabinoids or plant-derived trans-THC. In contrast, the production of these mediators was reduced by cis-PET. It remains to be seen whether this is a good thing or a bad thing. So while the study is just a start in understanding the mechanisms and effects of PET on the brain, there’s much we still don’t know. What we do know now, however, is that the levels of PET that are found in the natural liverwort plant are too low to produce the recognised effects of THC, so smoking it is unlikely to lead to a high. But it is also interesting that this compound could well have medicinal benefits without the high – one of the key reasons that THC has previously been dismissed as a medicine. Illegal trading and cultivation has confounded much meaningful clinical research, but this is changing and this new compound will add to the treasure trove of plant-derived cannabinoids that we still have much to understand.